Audrey Hepburn’s son, Luca Dotti, has edited a book about his famous mother. 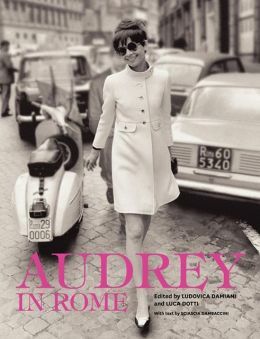 “Audrey In Rome” has over two hundred photographs, many of them never published before, taken during the time Ms. Hepburn lived in the Eternal City. Ms. Hepburn was a resident in Rome for over twenty years after marrying, Dr. Andrea Dotti, an Italian psychiatrist. I cannot wait to buy this book filled with photos of Rome and of fashion from the ’50s to the ’70s. The release date is April 16th. Hope you have a stylish and fantastic weekend. I loved this exhibit when it was at the Ara Pacis last year. What really struck me was a) how ordinary her Roman life was and B) How little Roman life has changed. I completely missed that exhibit! Sometimes I forget she lived in Rome for that many years. Can’t wait to read the book. I didn’t know Audrey lived in Roma for twenty years! This must be a very special book, would love to see into her life there. It is interesting that she decided to stay in Rome instead of moving to Hollywood. Previous Previous post: Thinking About Walk-In Closets During Cambio Di Stagione.